I've loved reading programming books ever since I was a kid! If you're looking for some good reads, consider these! Bill Wagner's book, Effective C#, 2nd Edition delivers fifty easily-digested best practices to take your C# to the next level. If you're an intermediate C# developer looking for a book to demonstrate some language features that you might not be using, or if you want to learn more about C# best practices in general, this book is for you. I gave it a solid 4 out of 5 stars. Read the full review. Almost every book I've ever read on game programming includes code examples that you'd never want to put into production – they keep the frills off of the examples in order to keep them short and clear. But I wanted to learn about the architecture that goes into a true commercial game. 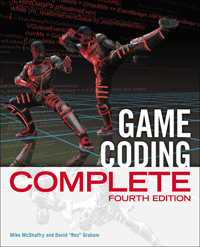 Mike McShaffry and David Graham do just this in their fabulous (and hefty) tome, Game Coding Complete. It covers the 20,000 foot view, but also zooms into specific areas, such as input, audio, physics, and tons more. If you're looking for a book that describes how games are really built, check this one out. Read the full review. Martin Fowler is unquestionably one of my favorite programming authors. This book is a classic that defines the foundational concepts of software architecture. The first section is a very readable narrative, and the second section details each pattern, including UML diagrams and code samples. Although it's a tad dated after ten years, this book is legendary and shouldn't be overlooked! 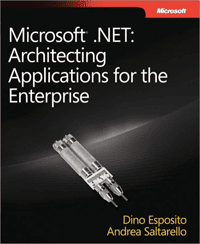 I never would have guessed that one of my favorite architecture books would come out of the Microsoft .NET community, but Dino Esposito's and Andrea Saltarello's outstanding book prove that there are some very sharp thinkers in the .NET world, for sure. The authors are able to take complicated issues and make them very understandable. In many ways, this book is an excellent, contemporary companion to Fowler's PEAA, and they reference that work frequently throughout. The code examples are mostly C#, but if you're fluent enough to read Java, you'd be able to follow along just fine. 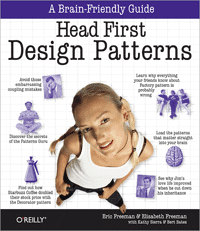 For a few years, there, it seemed like publishers would throw the word "patterns" into the title of a programming book and it'd instantly sell like hot cakes. This one, however, is one of the best ones I've read. For me, the Head First series has been hit or miss, but this one's definitely a hit. The authors do a fabulous job of getting the reader to think through the problem first, and then work their way to a pattern that solves it. If you've not read through a patterns book, or found the classic Gang of Four book to be too C++ for you, then you should give this one a read. FTC 16 CFR, Part 255 Disclosure: I have no material connection to the products above. All cover images are used by permission.